In response to the oil crises of the 1970s, America developed a bipartisan energy policy that made us safer, greener, and far less dependent on foreign oil. It was so successful that American oil Imports fell by fifty percent and greenhouse gas emissions dropped nine percent in just five years. How was this possible, and how can we do it again? • How can we break the links between oil consumption, terrorism, and the war in Iraq? • Will it wreck our economy if we deal with the tough issues of energy? • Which new technologies can help get us out of our current energy predicaments? • What kind of a president do we need to lead us to a better energy future? • Should we be pessimistic or optimistic about our energy prospects? Between rising oil prices, global instability, and environmental degradation, most Americans acknowledge the need for energy independence. Yet our political dialogue tends to focus more on rhetoric than substance, leaving citizens scratching their heads about what they and the country can do to break free from energy dependence. 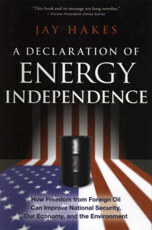 A Declaration of Energy Independence takes a nonpartisan, honest approach to energy issues and answers fundamental questions like whether the price of oil will ever go down; whether global warming is a real threat; and whether ethanol and other biofuels make sense in the long run. As the former head of the Energy Information Administration at the U.S. Department of Energy, author Jay Hakes had an exclusive, inside look at America's energy problems. Now, combining undisputed facts and solid science with historical and political context, Hakes offers his expert insight on the situation and presents viable solutions for a more stable political, economic, and military future for America. America's addiction to oil isn't just a pocketbook problem; in fact, it represents a grave security threat with even greater long-term consequences than the Iraq War. Far beyond the rising price of gas, our oil addiction puts dollars in the hands of foreign despots and funds international terrorism. In addition, any severe disruption in the flow of oil can leave our military virtually crippled and unable to respond to crises around the world. America can break out of the energy trap if we approach the issue honestly, intelligently, and with the political will to create a better future. A Declaration of Energy Independence offers a real-world look -- without the ideological blinders of the right and the left -- at how we got into this mess and, more importantly, provides effective solutions to get us out of it.